By creating Alzheimer’s in a dish, Mass General researchers have identified dozens of promising drugs that could help slow the disease’s progress. At Massachusetts General Hospital’s Institute for Neurodegenerative Disease (MIND), scientists and clinicians are intensifying their efforts to find therapies to slow the progression of Alzheimer’s disease and identify a cure. One of their most fascinating and promising efforts effectively involves creating Alzheimer’s disease outside the human body. Reigning in the disease has been an enormous challenge. While the survival rates for patients with many types of cancer and heart disease are improving, the number of patients dying from Alzheimer’s disease has been rising precipitously – increasing 68 percent since 2010. Today, more than 10 million families are affected by this devastating form of dementia. Alzheimer’s causes problems with memory, thinking and behavior. Symptoms usually develop slowly and get worse over time, becoming severe enough to interfere with daily tasks, and ultimately to carry on a conversation and respond to their environment. The greatest known risk factor is increasing age, and the majority of people with Alzheimer’s are 65 and older. Even so, approximately 200,000 Americans under the age of 65 have younger-onset Alzheimer’s disease (also known as early-onset Alzheimer’s). Using this model, Dr. Kim can test the impact of different drugs on the human cells with Alzheimer’s disease. Over the past decade, the traditional path for early testing of promising therapies – mouse models – has been ineffective in Alzheimer’s disease. More than a dozen major clinical trials have failed. 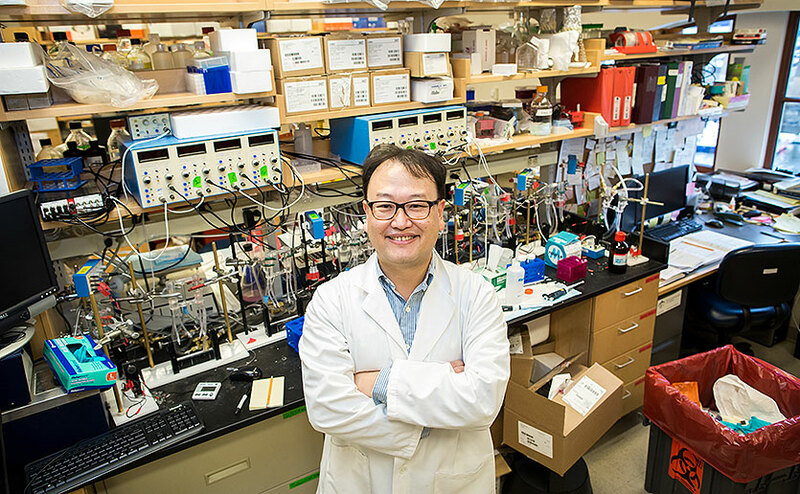 Doo Yeon Kim, PhD, an assistant in the Genetics and Aging Research Unit at MIND, is side-stepping the mouse models and taking a new approach to testing drugs with the potential to help patients. His team, together with Dr. Rudolph E. Tanzi’s lab at MIND, has been able to grow human neural stem cells in a three-dimensional gel matrix. The gel system allowed the cells to grow more naturally and form into 3-D networks just like they do in the brain. The team then used genetic engineering to encourage the neural stem cells to produce two proteins that are the hallmarks of Alzheimer’s disease: β-amyloid and tau. In the brains of people with Alzheimer’s, excessive accumulation of β-amyloid results in the formation of plaques in the spaces between neural cells, while tau is the main component of destructive neurofibrillary tangles within the cells. Until Dr. Kim’s success, no single model of Alzheimer’s disease contained both amyloid plaques and neurofibrillary tangles. Even more encouraging, the plaques and tangles took only six weeks to develop in the “dish,” when it usually takes a year to develop the plaque in mouse models. Using this model, Dr. Kim can test the impact of different drugs on the human cells with Alzheimer’s disease. This approach eliminates the interim, mouse model step and avoids some of the frustration caused by mouse models that don’t accurately reflect the behavior of human neural cell behavior when affected by Alzheimer’s. The speed and efficiency of this method is extraordinarily promising. The challenge now is to find the funding to proceed to human clinical trials. The speed and efficiency of this method is extraordinarily promising. Dr. Kim is working with a consortium of labs to test thousands of drugs in his “Alzheimer’s in a dish” environment. To make this work move as efficiently as possible, his team is working with a group of drugs that already have Food and Drug Administration approval for another use. Earlier this year, Dr. Kim’s lab teamed up with Drs. Stephen Wong (Huston Methodist Hospital) and Tanzi labs, to finish preliminary screening of FDA-approved drugs and additional biologically active compounds that can reduce levels of p-tau, a protein which is significantly increased in patients with Alzheimer’s disease. Among the group of 2,400 drugs and compounds, the team got approximately 40 hits, moving them on for further study. These initial efforts have been generously funded by the Cure Alzheimer’s Fund. The speed and efficiency of this method is extraordinarily promising. The challenge now is to find the funding to proceed to human clinical trials. Philanthropic support will allow the clinical trials to move forward. The next steps include modest, pilots, followed by multicenter trials. The hope is that these trials will lead to therapies that relieve the symptoms, stop the progression and ultimately, cure Alzheimer’s disease. To learn more about how you can support Alzheimer’s disease research at Mass General, please contact us.